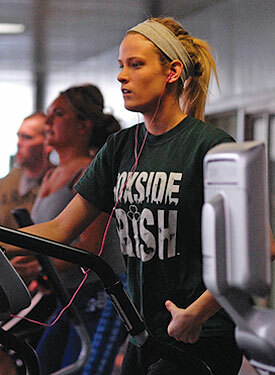 Along the balcony overlooking the activity spaces and on the main level of the Gillett Wellness Center are numerous pieces of cardiovascular equipment open to students and members of the fitness center. The majority of our equipment is Precor that includes treadmills, ellipticals, upright and recumbent bikes and stair steppers, We also have a rower and a NuStep. Numerous pieces of cardio equipment has cable television available from your very own personal viewing screen.